Calling on all levels of government to invest in cycling infrastructure to create a legacy honouring cycling deaths in Brampton. Cycling is inherently safe and benefits outweigh risks by at least 9:1, according to worldwide literature Teschke et al (2012). There have unfortunately been a few tragedies that have sparked this outcry for cycling legacy infrastructure to honour those lost to cycling deaths. 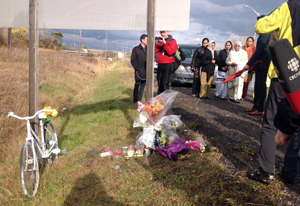 Toronto Group, Advocacy for Respect for Cyclists placed a Ghost Bike at the spot where Hardeep was killed. 25 cyclists from Brampton and Toronto gathered with family, friends, Raj Grewal MP (Brampton East), and Brampton Councillor Gurpreet Dhillon on November 7th. Ralf Jarchow, a Brampton lawyer, was tragically killed near Tofino BC, on September 24, 2015, as he neared the end of his bike ride to raise money for the new Peel Memorial Centre for Integrated Health and Wellness. BikeBrampton and Brampton Cycling Advisory Committee is working with all 3 levels of government to develop and implement cycling legacy infrastructure in Brampton.